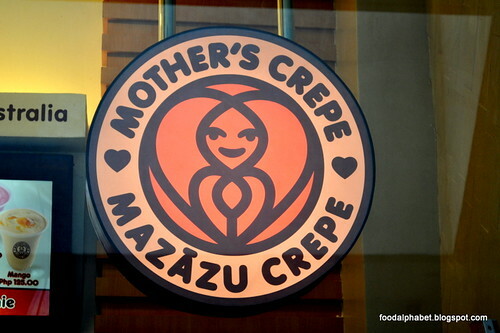 The Food Alphabet and More: Mother's Crepe and Cafe - Oh My Crepe! Excited? 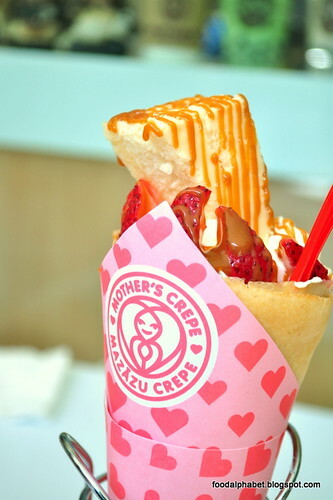 Well Mother's Crepe is a well known dessert store serving healthy and tasty crepes in Japan with more than 40 stores serving the Japanese population. All things has been considered in giving us that perfect crepe mix every time you bite into one. Each crepe creation is handled and made perfectly with utmost care from their more than courteous staff, just see how simple yet so skilfully they make these flavorful crepes, from the making of the crepe on the hot plate, to the pouring of the ice cream then to the placing of the many choiced toppings. 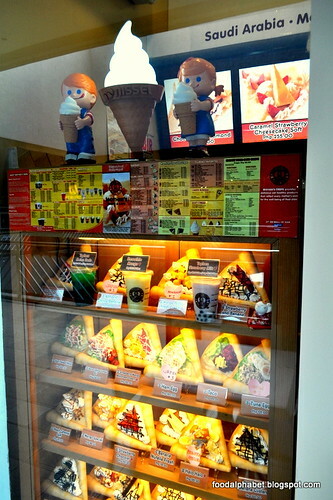 Enjoy Japan's Premium Soft Ice cream, you can have served in a cone or you may enjoy it in a cup as well. 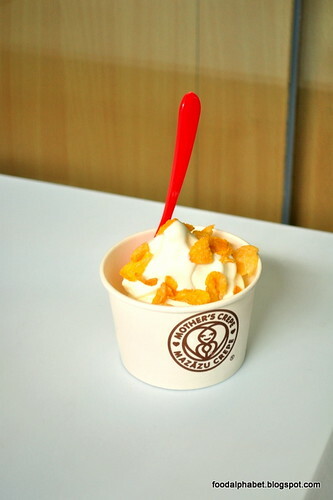 See it above it's Mango Fresh Cream (P75). 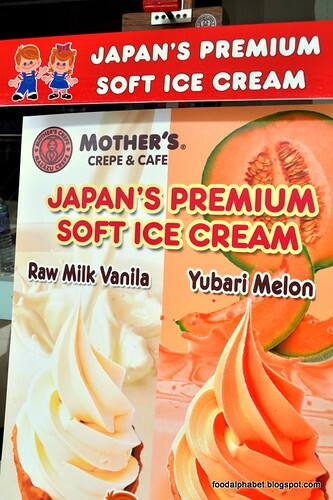 So you may ask, what would be the difference from other soft serve ice creams there are out there. First of all, they have 26% less fat content than any other soft serve ice cream, and they taste so much better, with pure ingredients mixed everyday, this is what you will exactly have in Japan when you get there. I have never tasted any soft serve ice cream so rich in flavor and so thick as is with Mother's Crepe. Take a slurp! You'll definitely love it. 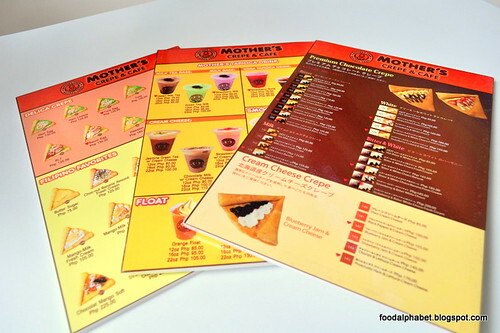 Enjoy Mother's Crepe with their wide array of drinks such as milk teas and fruit teas, cheese cravings, ice cream and more. You'll definitely find something to your liking. 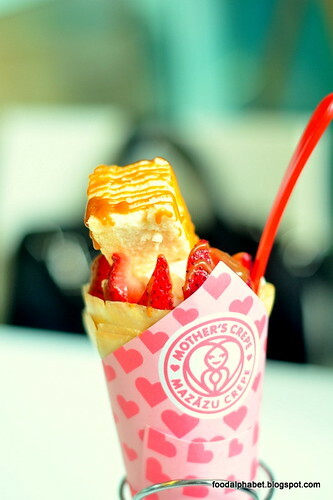 You can also do a create your own crepe, with so many flavorful and choice fillings. 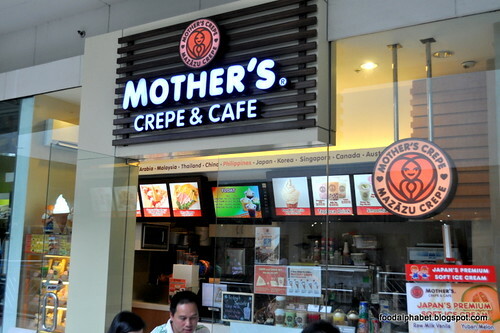 Visit Mother's Crepe at the 2/F SM Mall of Asia, Entertainment mall, Seaside Boulevard, Pasay City, you may reach them at (02) - 8041910. Hope they'll open more branches. Wasn't able to try it when I went to MOA since I was too full.